Well, the Howe Thanksgiving was certainly a success, our families enjoyed the time together, as well as the dishes, which were a first for some. 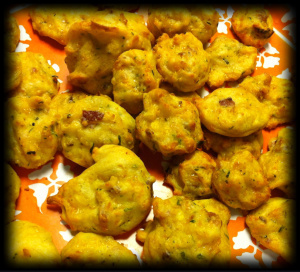 This post contains detailed recipes for a few dishes, and loose recipes for others. By and large, we try to season everything to taste. 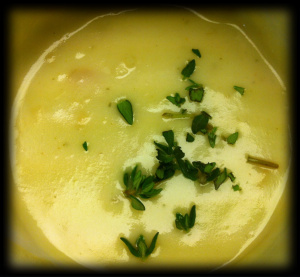 I started preparing a few evenings before, peeling 4 celery root and 1 potato, simmering for 40 minutes with 4 cups chicken stock, 1 tsp salt, and 2 tbsp thyme, and pureeing for our bisque. It didn’t take as long as I thought it might, and it tasted pure and delicious. I refrigerated until Thursday, when I reheated on the stove with 1/2 cup of whipping cream, then added chopped thyme to garnish. The gougeres were delicious, and simply a must try for any Holiday party. Little Rhea and I made these ahead of time, froze them, and reheated them to serve. We started with 1 stick of butter which we melted on medium heat in a saucepan, added 1 cup of flour, 1/2 tsp salt, and 1 cup of water. Once blended, we added one egg at a time, whisking to smooth consistency each time, until 4 eggs were added. Meanwhile, we cut the corn from 2 fresh ears and roasted them at 400F. To the dough mixture, we added 4 chopped crispy slices of hickory bacon, 5 ounces of cheddar, 2 tbsp of Parmesan, 2 tbsp of fresh chives, and the roasted corn. We spooned the mixture onto parchment covered cookie sheets, about 1/2 inch in diameter, at baked at 375F for about 30 minutes. These were an instant hit with everyone, especially the kids. As always, the sommelier brought in some great wines for us to sip on all day. We enjoyed some Proseco Italian Sparklers with our appetizers, which were mixed with Central Market blood orange or pomegranate Italian Sodas. 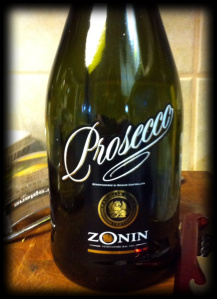 Because we mixed the wine, we used non-vintage Zonin Proseco. 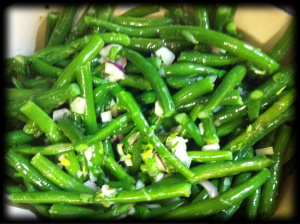 We forewent Haricot Verts for local green beans from Hondo that we found at Central Market. 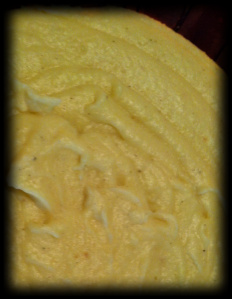 The herbed butter consisted of tarragon, parsley, shallots, and lemon zest. 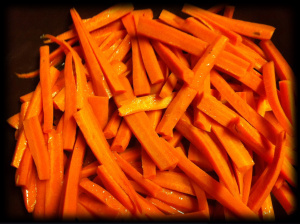 The cider glazed carrots were simmered in fresh cider from Fowler Farms (New York), butter, cider vinegar, and water. Salt and pepper to taste. 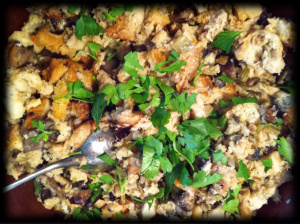 The stuffing was one of my favorites. We browned about 8 cups of cubed Pullman Loaf in the oven (400F for 15 min), which were able to find fresh at Central Market (saving us loads of time). In the meantime, we browned about 8 medium shallots, diced, in 1 stick of butter, and added 2 pounds of sliced cremini mushrooms and 2 cups of chopped celery. We also added 2 tbsp fresh sage and 2 tbsp of thyme. Once all the liquid was evaporated from the saute pan, I added about 3/4 cup of white wine to deglaze. I choose to use Barefoot Sauvignon Blanc for my cooking wine, as I support their business model, and it is priced reasonably (about $5.97 at HEB). We emptied the toasted bread into a large bowl, then poured the mushroom mixture on top. In a separate bowl, we whisked 4 cups of chicken broth with three large eggs, salt, and pepper, which we then added to the mixture. We transferred the stuffing to a baking dish, and baked at 400 for 30 minutes. To ensure the stuffing was crisper, we added pats of butter to the top of the mix before baking. Once cooking was complete, we added fresh parsley to garnish. The potatoes were mashed through a strainer with roasted parsnips and garlic, then blended with whole milk, butter, salt and pepper. 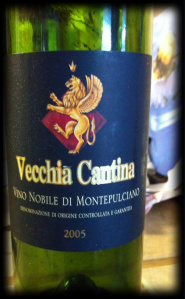 At dinner, we enjoyed a 2005 Vecchia Cantina Vino Nobile di Montepulciano, a Sangiovese with notes of dark plum and cherry and a hint of tobacco. We decanted the nectar for about an hour before drinking. 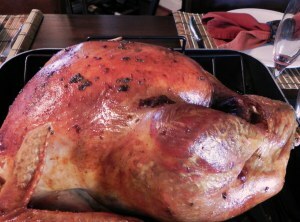 We had two turkeys this year, one roasted and one fried. 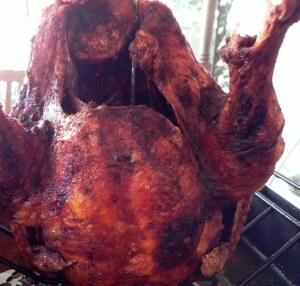 The sommelier used a Cajun Butter Injection for the fried turkey, whereas we brined the roasted turkey. Either way, they both turned out fabulous. The sommelier also prepared the gravy, in which we used turkey neck stock and pan drippings for the base. The sommelier always does a fine job with the cranberry sauce. 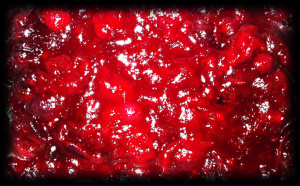 This year, he mixed the fresh cranberries with 1 cup of sugar, 2 tbsp of rum, and the juice from 2 tangerines. He set on medium heat on the stove until desired consistency. Salt to taste. 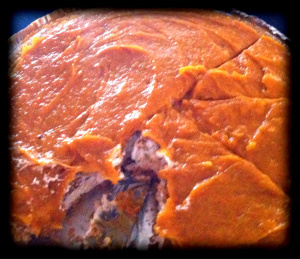 My sister Karen makes this pumpkin cream cheese pie. I am unsure of what she does, but it is always delicious! 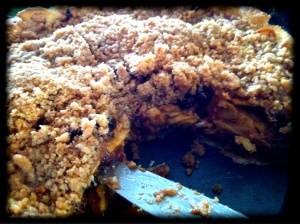 My mom helped me make this apple and raisin crumble pie; I note that baking is not my forte. I did make the crust, however, adding just a few tsp of apple cider vinegar and using ice water to keep the dough flaky. The filling was made with 6 peeled and cored granny smith apples, sliced, with 1 cup of raisins, 1 cup brown sugar, 2 tsp vanilla, 1.5 tsp cinnamon, 3 tbsp flour, and grated lemon peel. We also made the crumble using cinnamon, butter, brown sugar, salt, and flour. Not bad for my first apple pie, if I say so myself! Our dessert wine was truly special. 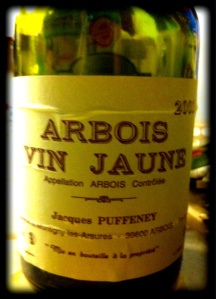 The sommelier bought out the good stuff: a 2001 Arbois Vin Jaune. Made from Savagnin, this 8 1/2 year aged wine has the nose of almonds and the palate of dry sherry. Since we only host Thanksgiving once every four years, the sommelier and I both know that next time around, things will be different. Perhaps simpler, perhaps more likened to Rhea’s tastes. This year, though, I truly enjoyed the challenge of our complicated menu, even if I needed an extra glass bottle of wine to get through it all. Cheers! This year we are hosting Thanksgiving. The monumentus task of appealing to the palates of not only me and the sommelier, but my parents, my oldest sister and her family, and my in-laws, is daunting. It has been four years since the sommelier and I have hosted the annual meal, and so, we have had the occasion to enjoy many fine versions of turkey, stuffing, and cranberry. My mother has always made this fantastic jalapeño stuffing, my father giblet gravy, and my oldest sister a cream cheese pumpkin pie. The sommelier and I have always provided wine, and the past few years, the cranberry sauce as well, but still, I was unsure of what we would serve for our first official Howe Thanksgiving. This will be the first Thanksgiving that we will host as a complete family; the sommelier and I and the little girl, who is already showing signs of foodie traits. 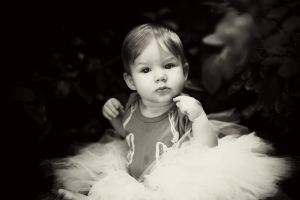 Tomorrow we will begin the preparation for our meal, as little Rhea, the sommelier, and I will head to Central Market for parsley root, parsnip, and local cider. We will contrive a shopping list to gather our ingredients, bond together through local selections, and wander the aisles, searching for best kept foodie secrets. It will be our first tradition in the Howe household, hopefully one of many more to come.